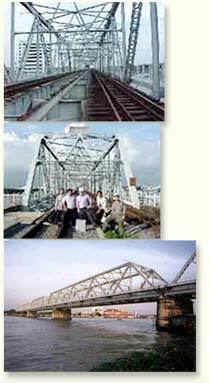 The Rama 6 bridge is the Thailand's longest steel truss bridge crossing the Chao Phraya River located in Non Thaburi. The bridge was destroyed by airplane bombing in 1942 during the World War II. The bridge reconstruction was later on completed in 1953. The bridge is the main rail route connecting the central part to the southern part of Thailand. The bridge is 442 meter long, 10 meter wide comprising of 5 span trusses, 2 simple spans and 2 anchor spans that support a suspended span through a pin and a link connection. The link connection of the suspended span is supposed to be able to move freely as a so called "roller" per structural design concept. However, the link was moved from the center of the horizontal guide and become "locked" at one end of the guide, which can not be moved freely as it should be. As a result of this "locked" link, the bridge behavior has been changed from its original design concept, which may cause numerous problems in the future. It is necessary to 1) determine the cause of the link "locking" at one end of the horizontal guide 2) reset the bridge so that the link can move back to the center position 3) perform further study and evaluate the bridge safety. (1) A complete bridge inspection. (3) A residual stress determination of the structure. (this was done to determine the force and reaction of all supports). (4) Structure monitoring on the bridge movement. (this was done over a two year period using GPS, tilt meter, etc). (6) Non destructive testing of fatigue prone and of load-carrying capacity of critical members (the pin an the link connections). Ultrasonic and Acoustic Emission ware the Non destructive testing method being used. (7) Dynamic magnification to evaluate the impact effect of the train to the structure.